I'm finally retired! I handed my crown to my successor on 30th September 2006 to proudly represent our country in the world finals. It's not like its a relief or anything .. actually kinda sad man .. eh, how also I was the queen for the year ok! Kinda missed the priviledge during the pageant. Man it was a great experience! It's my first pageant.. well, although I did win the Miss MMU 2004 pageant back in my uni days (its not an official pageant laa). I had so much fun in Penang, the crew were a bunch of amazingly fun people. First up, dear Priscillia .. she's one attractive lady, there's jez something about her. Her looks damn ganas, like no nonsense person. But we did clicked very well and turned out to be a bunch of nonsense gal! Then there is Kah Hoong, my personal chaperon, bodyguard, entertainer, etc etc. Guess his job was to attend to my daily needs .. more like a butler! Good looking chap, a charmer, lady-killer ba.. hahaha .. a swimmer from a very young age = great bod! That's my guessing from the outlook laa .. whoever got to see the inside please feel free to correct me if I'm wrong k. Girls .. start drooling .. hahahaha ... of course, there are many other very goodlooking boys i.e. Thomas, Jason, Jerry .. errr .. that's all I remember ba .. There's much to comment on this guy .. but I'm afraid he'll kill me if I do !! There's loads to write abt sweet mandy as well .. but he too will kill me as well! haha ..
And lastly there was Wen Kang. This guy is a very very very very talented tarot card reader! Damn accurate! I had mine read .. I'm impressed. He was the MC for the night, heard that he used to be a DJ at MY.FM. Now he's into events ... and currently working on a book. I hope to see him real soon! Lots to ask from his Tarot readings !!! Oohh ... i forgot all about the winner. So self-centered of me. ahhaha ... Like so unwilling to give up the title man! 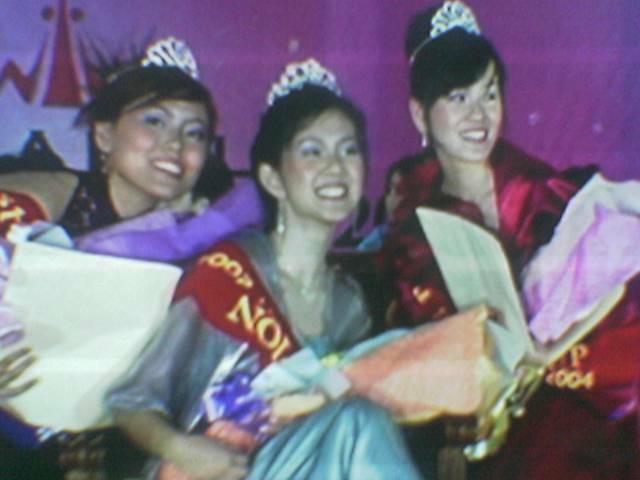 Hahaha .... Presenting to you .. Ms Alice Loh as Miss Malaysia Earth 2006.